This comprehensive three-DVD set is a must-have resource for both female and male gymnasts and coaches at any level. The program provides personal lessons from World Champion and a three-time Olympic medalist, Paul Hamm. 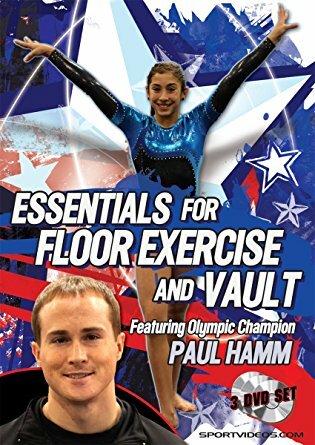 The DVD set is designed to teach the essential skills, drills and progressions for floor exercise and vault. Paul starts with the basics and then moves on to more advanced and elite level gymnastics. Paul shares with you all of the tips and tricks that helped him become one of the top gymnasts in the world. Another feature of this DVD set is detailed video analysis, using voice over, drawing tools and slow motion. This method of teaching is extremely beneficial and will help you develop a deeper understanding of the complicated techniques in gymnastics. About the Coach: Paul Hamm is the most accomplished male gymnast in the United States history. He has a total of eight World and Olympic medals. In 2003, Paul became a World All-Around Champion and also a World Champion on the Floor Exercise. In the 2004 Athens Olympics, Paul became the first American to win the coveted All-Around gold medal. Paul has spent his life dedicated to mastering the complicated techniques in gymnastics. He has coached all levels from beginner to elite. Paul now coaches gymnasts throughout the country utilizing state of the art video analysis technology.